Bone broth made from chicken feet? Real chicken feet? Do you think that you could handle it? I never thought I could until our family went gluten-free and I became a mother on a mission… A mission to heal inflamed intestines. A mission to re-balance missing nutrients from the malabsorption caused by my son’s Celiac Disease. So yes, I took a plunge, and a somewhat repulsive risk, and started making my own bone broths with none other than the cockeyed, and somewhat disturbing looking chicken feet. After all, I had watched my Grandma make hers for years. If she could do it….well? Did you know that true bone broths (especially those made from high quality bones of wild, organic grass-fed chicken-particularly the feet, beef, or pork) are rich in calcium, phosphorus, magnesium,silicon, potassium sulfate, flouride, collagen, glucosamine, chondroiton, and other trace minerals? Did you know that these minerals in the broth are very readily absorbed by the body in this form? Did you know that homemade bone broths are also rich in gelatin (especially those made from chicken feet), which is considered healing and coating to the stomach and the digestive tract, perfect for those dealing with gastro-intestinal disorders? Did you know this gelatin is useful in hypo- and hyper- stomach acid issues? And, finally, one last question… Did you know that it is one of the cheapest and easiest ways to acquire some of these unbelievable health benefits? No? Well, it was not until I really started researching what Grandma had known all along, that I really come to understand these abounding health benefits. Until then, it was just something I swore I would never make, let alone drink from a mug…. (or make my rice, pastas, sauces, stews, or soups with). 1. Promotes healing: Bone broths have been used successfully in treating gastro-intestinal disorders, including hyper-acidity, colitis, Crohn’s disease, and infant diarrhea. 9. Delicious and nutritious: use as soup, cooking liquid, sauce or as a tea. I do want to mention that I decided to not post any pictures of the chicken feet in ANY stage of this cooking process (well not real ones anyway). Why? I would love say it was because I wanted to spare you wonderful readers the shock and fright of such images. I would love to say that I was only thinking of you and the fact that you very well may be in the middle of a meal while reading this. And yes, I would love to say that I am just so sweet like that. But, no. It was my husband who balked in utter disgust when he saw the visual image that I wanted to share with you. It was he who said I just could not post them. So, strangely enough, it is he that is just so sweet like that. So as not to frighten you…. Note: you DO NOT need to use chicken feet to create an amazingly nutrient-dense bone broth. I do not do it all of the time. Often, I will just use all different parts of the chicken (or beef bones). After making a big batch, I then freeze it in 12 ounce quilted mason jars to have it on hand for whatever I am making. Making broth requires almost no work, just put the bones and vegetables in a pot, add water and vinegar, bring it to a simmer and walk away. No chopping or tending is needed. It really is that easy. 1. Put bones in large stainless stock pot and cover completely with the cold filtered water. Add the 2 Tablespoons of vinegar and all of your vegetables (except for the parsley). Let it sit for an hour just as is without turning stove on. 2. Then, bring to barely a boil, and remove the scum that is rising to the top. 3. Reduce heat to simmer, and let it go for 6 to 24 hours (the longer the better since this allows the gelatin to get released from the bones and gives much more flavor to the broth). 4. In the end of your cooking time (during the last fifteen minutes) you can add your parsley (and any additional fresh vegetables for a last hit of flavor). 5. Then strain the stock through a fine mesh sieve into a bowl or glass container. Then place container into refrigerator and allow the top layer of fat to congeal. Remove this congealed layer, then pour the remaining stock into your containers. Quilted Glass mason jars work wonderfully for this. 6. Then use as your liquid when making rice, pastas, sauces, soups, stews, in a mug…. Just season to taste for appropriateness for your recipes. Voodoo Stock: Chicken Feet and Chili Peppers, by Jenny, of Nourished Kitchen. I bet you would be amazed at how easy it really is to make your own bone broth…Try it. It is perfect to have on hand during the virus-filled winter months. Now, the true question: would you be willing to try it with chicken feet? Oh this is a scary one. I’ve been reading about the benefits of the chicken feet/bone broths for years and still cannot bring myself to face it. You are brave. 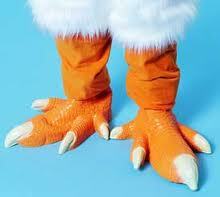 Just love the fuzzy chicken feet pic. I have not yet ever made my own stock, but I have read all about how great it is for gastrointestinal disorders such as my own. I just bought some free range organic chickens, and was sure to ask to have the feet and gizzards and all! So, thanks for the recipe, I will be making my own stock very soon, feet included! I’ve been making my own chicken broth for a few years but I really don’t know if I could handle the chicken feet! Where would one even get chicken feet? I’ve never put vinegar in at the beginning – I’ll have to try that next time! Sarah, chicken feet can be a little hard to find, but I have gotten them by just asking the butcher. Plus, most asian markets carry them as well. Tia, this is great for stomach bugs. You can even drink it from a mug – just add some extra sea salt and seasoning to it (and I even add a little pat of organic grass-fed cultured butter to mine). Yummo! Boo! I hope you all feel better soon! Found chicken feet! MY local Whole Foods had them in the back. Just had to ask for them. The come in 2lb frozen packages. So, now I have a whole chicken AND 2 lbs of chicken feet. Gonna make a lot of soup. Thanks, Kim! LOL! I love you, Tia! You crack me up! That is awesome that they had the feet. My WF here has them sometimes too! You are going to have some nice gelatinous (that is a gross word if you actually think about it) bone broth!!!! Yippee! Hope you are all on the mend soon, my friend! Hi, this is my first visit and I am so happy to see this post! My stepdaughter brought me turkey feet last year. She was so excited.. kind of like when your dog brings you part of some little critter because he loves you so much. It was the strangest thing I had ever seen, but they made some great broth! (She works at a school where they raise and slaughter their own poultry, so it really was a very generous gift!) I Might have to dig out the pictures we took….they are pretty freaky! I DEMAND to see those chicken feet. : ) Okay, maybe not … might bring back sweet memories of taking my husband (then boyfriend) to Dim Sum in Seattle 10 years ago. The next time I’m playing Swedish Chef with a whole chicken I will come back to your broth recipe. It must be so satisfying to use every bit of the bird. To be honest with you I can’t say I have ventured there yet. Thanks for giving me the courage to try. Absolutely! I even posted pictures of my chicken feet! I love stock made with chicken feet – it is so rich and thick and wonderful! I love your picture of chicken feet! Okay, Christy, that post is awesome! I just linked it up in my post where I mention about Kelly the Kitchen Kop’s post as well. I love all of your pics! LOL Thanks so much for sharing the link with me! It will be another great resource for my readers to refer to! Yay! I make a lot of my own broths (bone versions) too (thanks to Sally Fallon’s influence). It makes sense for health reasons and for ethical reasons (using every bit of the animal). You bring up another valuable point with a recipe like this — the sad fact that we’ve strayed so far from the nourishing focus of our grandmother’s recipes. It’s easier and less “icky” to opt for pizza delivery or MacDonald’s than it is to take the time to make a nourishing broth like this as a foundation for soups and stews. What you have here is SO unbelievably healthy and probably cost less than feeding a family fast food. I’m sure you took you some time to make, but still — we’ve strayed too far from our healthy roots. Great post, Kim! It’s right up my alley. P.S. I LOVE your substitute photo for the chicken feet. PERFECT! I cannot believe how different many people eat nowadays compared to our grandparents. I love that you make a lot of bone broths as well. It really is so easy to do and then just store away for later uses. Plus, I think it is so much cheaper than buying the organic stocks that I would be buying if I were not making it! Hi Kim, I agree with all your points in this post! We’ve made chicken soup before (really basic), though we’ve yet to try doing a broth made with just bones…or chicken feet. We have found, though, that when we make chicken soup with bone-in chicken that the broth seems a bit richer, for lack of a better word, and the flavour enhanced. I could try this without being afraid, but I just can’t manage chicken feet at DimSum. They scare me for some reason. I know it’s probably just cultural as I can happily use pigs trotters! Wierd huh? Hi IntolerantChef! Yup! Chicken Feet can definitely be reminiscent of dim sum. And I agree with you there that I cannot manage actually eating them. For some reason, when you use them in the broth and then take them out, it is just not the same. I’m so glad you shared this recipe at Family Food Fridays. I had absolutely no idea about bone broths and surely not chicken feet! After reading your post I went from ‘Oh hell no’ to ‘Hmm, maybe I could do that’ – great post and great recipe! Thanks! Hi Julie! So excited I converted a “Oh hell no” to a “Maybe I could”! Woohoo. That alone made this post worth it! 😉 So glad I was able to share it with Family Food Fridays this week! Okay Shirley, now squirrel brains is definitely something that would keep me Scared Silly!!! And I too grew up with livers and gizzard, LOL! I give your dad a lot of credit for loving those!! And, yes! I love how soothing a nice cup of warm broth/stock is. I add some sea salt and a pat of pastured butter and it is delish!! I prefer it over tea, actually! And on the note of broth vs stock, I grew up thinking that broth was made with the meat and stock was made from the bones, but Sally Fallon refers to it as bone broth (but also refers to it as stock, interchangably), so since she is my inspiration for this recipe, I just went with her terminology. I do totally think it is funny that the husband’s feel the need to help censor us. I am thinking mine is afraid I will totally embarrass him one of these days, LOL!! I love learning these new things about living healthier! I will try to save all that good stuff from the turkey this Thanksgiving to get all the goodness into a broth. Great instructions–thank you for linking to Food on Fridays! Hi Anne! Ooh! Yes, the broth from the Turkey bones is absolutely fabulous!! I will be doing the same! I can’t wait!! My most favorite thing about THanksgiving growing up was the stock and resulting turkey soup that my grandma would make the next day. We would seriously eat it every day for a week after Thanksgiving! 😉 Thanks for letting me share it with you on Food on Fridays! I’ve been making bone broth for about 8 months. Can I ask what purpose does the vinegar do for the broth? I have never head of using it and with my diet restrictions I cannot have it. Just trying to figure out if I *must* substitute it for something else. If I run across some chicken feet I may try this, although after looking at the step-by-step directions on one of the referring sites, I’m not hyped up at all to jump on clipping the toes. EWE. I might experiment to see if the cooked version of the apple cider vinegar hurts me or not. HMMMM. The no-acid diet restrictions can be very difficult. I have known many people going through that. I am wondering if, since there is only 2 Tbsp of the apple cider vinegar to the entire pot of broth, if it would not affect you too much. On that note, have you looked much into Braggs Apple Cider Vinegar benefits? This is a really really good link talking about it’s benefits. This could possibly be better for your diet restrictions. I’m a little late in making this comment but, for your interest, apple cider vinegar, although acid, alkalises once it is in the body. The same applies to lemons. For this reason, it should be safe for you to add the vinegar. This is a great website and I hope to return again and again. Hi Bibi! Thanks so much for your great advice to Julia! Your answer is right on. ACV becomes alkaline once in the body. Can you post the recipe for the spicy lentil soup please? LOL! Annie, just yesterday I was wondering when someone was going to ask that. I will post it this week, but can send you an email today with the actual recipe! 😉 Thanks for asking and for reminding me! I have made beef broth and when it cooled it was gelatinous, but even with chicken feet and recently with a whole chicken, I have not been able to make a gelatinous chicken broth. I am following Sally Fallon’s recipe and using chickens purchased at Whole Foods. What am I not doing to get a gelatinous chicken broth? Thanks so much for your help. You can use lemon juice instead of vinegar. For some people, it is much less harsh. And as cook it says, it really doesn’t take much. I attempted to make a bone broth over the weekend. I chose to use chicken wings as that was a recommendation of Sarah Moulton from the Food Network (http://saramoulton.com/weeknightmeals/episode-103-soup-for-supper/). From what she stated on her web site, the wings have similar properties to chicken feet (and I couldn’t find any chicken feet at my usual grocery haunts). I opted to begin it on a Friday night and let it cook overnight. After getting it to a boil, I turned the gas stove down as low as it would go. However by the next morning all the water had boiled off and I wound up burning the bottom layer of chicken wings. I was at least able to salvage most of the meat but ended up using a gluten free chicken broth I had picked up from the local Whole Foods in order to make it into soup. Any suggestions as to how to go about making a broth when your stove doesn’t have a low enough simmer setting? I don’t have a pressure cooker or a slow cooker. Janet, look in the manual for your stove to adjust the burners. I have a gas stove also and there are 4 burners, one very large one, a medium sized one, and two small ones. I designated one of the smaller ones to adjust for the purpose of a low, slow simmer. Sorry about your burned pot! I’m currently researching homemade baby formula. I will have to go with the bone broth based version from weston price. Anyone ever heard of it? I wanted to go the goat milk route, but my baby cannot tolerate any dairy. I’m hesitant on this version…but…may try it. Thank you for your article on bone broth! You simply can’t go wrong with Weston A. Price. If you take the time to “digest” all the information contained in the Weston A. Price website and/or read the extensive section in the book (which I highly recommend), NOURISHING TRADITIONS, by Sally Fallon and Mary Enig, you will find a wealth of information about good, nutrient-dense food. You will also learn that much of what we have been fed by the agri-industry is hardly more than artificially flavored, highly salted and/or sugared texture. The beef broth recipe from Nourishing Traditions is exceptional. If you make the large quantity that makes up from the recipe in the book, you can freeze it in ice cube trays (each cube about an 1/8 c., or 3 Tablespoon quantity) and use it as needed for your baby or for soups – yummy, yummy – or for sauces and for steaming rice, etc. Of course, you probably already know that using the microwave for almost anything other than boiling water usually damages nutrient value, so just pop it in the pan for cooking purposes or give it a few minutes to defrost before giving it to your baby. Be well! Blessings on your new addition to your family. SO glad you’re doing the ’24 hr’ bone broth! I’ve been doing a very close version of it (www.SoupMagic.com) for over 7 yrs now, with or without chicken feet, and it’s been a tremendous boon to our family health. May MANY more take up the bone broth tradition and make it the backbone of their kitchen! Thanks so much, Ann! The bone broth has been a total boon to our family’s health as well! I use it in so many things. I, too, hope that this is something that will “catch on” with the masses. It could help with so many different ailments! I love your site, I just found it while searching for a non-soy cream cheese and when I came back to get the recipe I found this post about bone stock. My niece raises chickens (free range, no corn soy or wheat feed) and offers the feet for sale separately. I have just recently been more serious about avoiding GMO food and also commercial “feed lot” mass produced meat so I was excited to be able to get chickens from a reliable source but for the world of me I could not imagine what anyone did with chicken feet. Now I know and will try it! Thank you for the post. For the nourishing gelatin if chicken feet are not available, or tolerable, the bones of the carcass and limbs should be broken, releasing more minerals and gelatin. The acidic presoak does help, but can be skipped in trade for longer..slow.. cooking. White wine works too, if that’s acceptable. Also, turkey wings are a great cheap source of flavorful, gelatin rich broth, or as a fortifier to chicken. Hi, I have never herd of using chicken feet before! one of our cab drivers told me about the benifits of it and that his wife makes the bone broth with it. I would like to try it! what kind of containers do you use and how do you store it? how long dose it stay? Dose it stay in liquid form or is it like a gel? I enjoy sipping chicken broth but the cubes are so salty that I don’t drink it much! We’ve never used feet, but I’m up to try it! I wondered about washing though. We always rinse/wash any whole chickens we’re using prior to making stock. Do you wash the feet first? I can imagine that chickens have walked around on some things I’d rather not be simmering into my broth. Nice article! While I’ve never used chicken feet, I’ve been making broth from bits, so to speak, for decades. It’s just how we’ve always done it, so I never thought of calling it anything but soup stock. One thing I’ve found here locally is that when the market gets whole turkeys in near holidays, many people want only the breast. The other parts are packaged and sold at a fraction of the cost — especially the necks and backs! The clerk probably thought I was nuts to go through with a gazillion packs of turkey backs, but at 29 cents a pound, that is one inexpensive way to make a wonderful soup! Haha! I have done the same thing around the holidays and collected the extra necks and bones from the Whole Foods butchers. They know me now so don’t think I am so crazy any more. 🙂 You are so right… you cannot beat the price to be able to make something so nutritious. help… been making beef bone broth. i’ve only had a few batches gel…. is it still healthy if it did not gel? Hello. Can I just say how much better I feel to know I am not alone. We have a stomach issue going through our house so my OCD and anxiety is through the roof. My brothers family, who I do not see on a daily basis, has had the dreaded bug for 3 weeks!!! I am more stressed then ever. I want to attempt to make this but I had a question. How do you store the remaining broth?? Also can you cook it in a crockpot. I cant begin to thank you enough for your site!! Sometimes just talking about it helps. Have been boiling my chicken for years, using the plain broth for other things – like quinoa & pastas. When done in a crockpot, how long does it take? Then I don’t have to watch it.